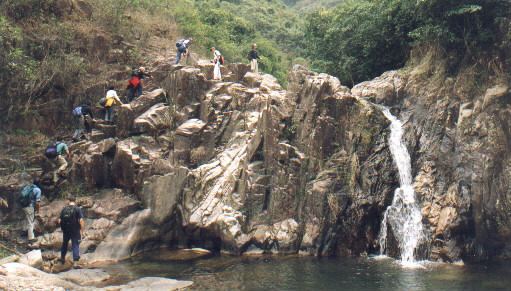 Lotus stream is one of the Nine Big Streams in Hong Kong. 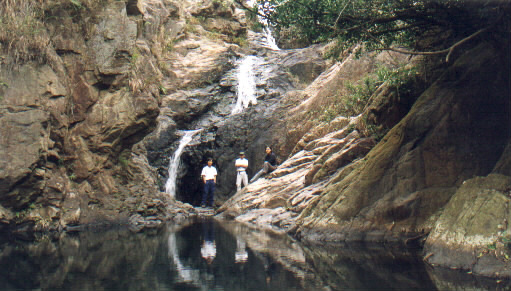 This stream locates at the upper right hand corner of Tai Lam Chung Reservoir. 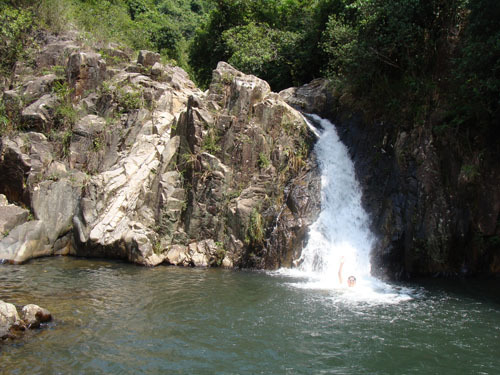 It is characterized by a series of clear natural swimming pools. It is a good place to spend a day in hot summer time. We have visited this stream a couple of times since last century (:)). Recently, there are much more overgrown than before. However, it normally takes you an hour of walk from main road to the entrance of the stream. This is the entrance of Lotus stream. This time we have a big group, 13 hikers. The lower stream is narrow and boring. This is the first swimming pool that you will encounter. This is called White Lotus Pool(白蓮潭). This picture was taken in a lazy summer afternoon 20 years ago. After a while you will find a tall red vertical cliff on your right. Hiking veterans called it Red Lotus Cliff(紅蓮絕壁). The cliff is really reddish brown in colour. Here is a jet of water stream dashing out from a tight rocky cliff. 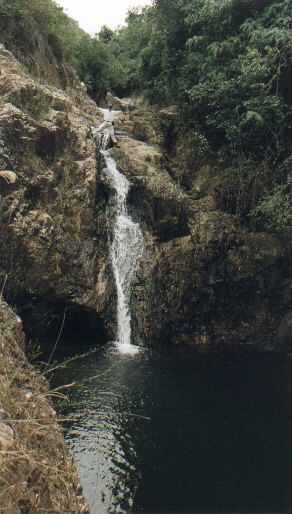 This water fall is about 15M in height. Could you see a guy in white "riding" the water jet? This water fall is given a nice name of Rainbow Fall of Red Lotus(彩瀑紅蓮). In summer time, the same water jet looks totally different. Right after the Rainbow Fall of Red Lotus, here comes the Lotus Terrace Fall(蓮台飛渡). There is a easy rocky slope on the left to lead visitors to the top of this fall. The picture on the right was taken in dry season. In rainy season, it is a water fun paradise. The pool is clean and deep with direct sunshine. If you will only swim in one pool in this stream, it is the one. It is nice place to cleanse your soul and body! Now you are in the relatively boring middle stream. This big rock is here to cheer you up in the middle stream. This is called Lotus Rock(蓮台石). It is a pyramidal shaped big rock. 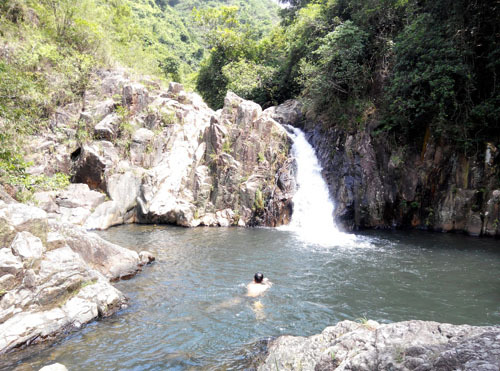 This is another nice short fall called Hidden Valley of Fairy Lotus(幽谷仙蓮). One can take pathway on the left to reach the top of this cascade where you can find a trace of foot path on your right. The foot path lead to the main trail. If you keep on going up along with the water stream, you will also meet the same trail pretty soon. This is what you will see when you get to the top of Hidden Valley of Fairy Lotus. This is the tallest and majestic water fall in this stream. This fall is called Curl Dragon Fall(蟠蓮飛瀑). You could overcome this fall by using the left path of the fall. 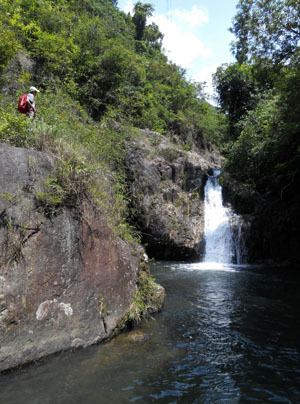 However, you have to switch from the left side to the right side in the middle of the water fall. That means you have to walk across the water stream on a brink! It is perilous when the water flow is fast and affluent. This is the cross-over I am talking about. There is a very nice pool before ending the journey. Although the pool is small, it is deep with fanatic views. After that, the stream becomes completely flat off. 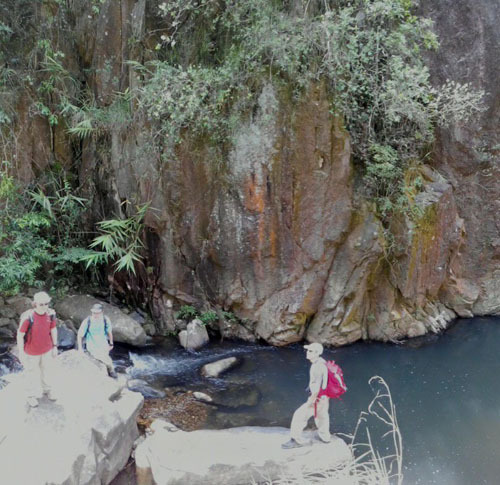 The exit route is on the right of this pool and you will meet the main trail in several minutes.